While it hasn’t been publicly announced, Facebook is now telling marketers the Sponsored Results search typeahead ad unit it began testing last month “launches today”. It lets marketers target users searching for specific apps, Pages, and Places and insert a link into the typeahead results that points to their own app, Page, custom Page tab, or post. Businesses cannot direct users off-site with the ads yet, though they can appear above the top organic result making them powerful for diverting traffic from competitors. Currently Zynga (shown above) and Match.com are running Sponsored Results. The ad units could allow Facebook to begin challenging Google for search ad dollars. Facebook has made some alterations to the Sponsored Results design since they first began testing them. They now appear in a separate, black-bordered section in the typeahead results. That’s makes the fact that they’re paid marketing much more clear than the tiny gray word “Sponsored” at the bottom of the ads that appeared previously. Users also have the option to “hide the ad” by clicking a small ‘x’ in the corner, which pops up a question about whether someone hid it because it was “Uninteresting, Misleading, Offensive, Repetitive” or one of a few more options. Advertisers meanwhile will soon be able to purchase Sponsored Results through the Power Editor, Facebook’s native Ads API tool, and Sponsored Results appear in the Ads API documentation for building third-party buying tools. Facebook is getting aggressive with the ad placement. Sponsored Results can appear above the organic result for what a user was obviously looking for. 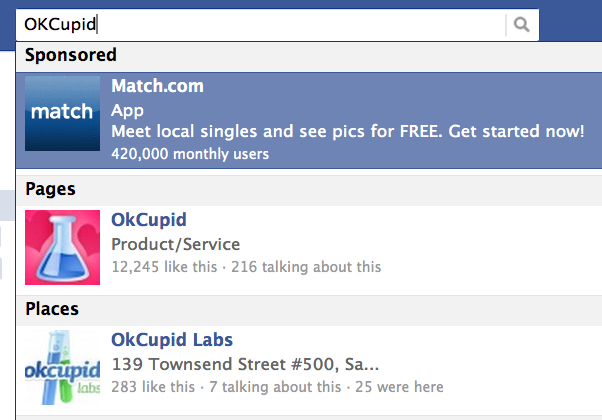 For example, a search for youthful dating service “OKCupid” returns a Sponsored Result for Match.com’s app above the organic result for OkCupid’s Page and office Place. This could be a powerful way for games and apps to redirect traffic from competitors with products appealing to similar audiences. Unfortunately, Facebook Sponsored Results may still be a lot less helpful to advertisers than those that show up on Google Search. That’s because when people search for an entity on Facebook, they’re typically looking for something very specific, such as a particular game or business, and might be more more likely to bypass ads. People don’t usually search for “camera” on Facebook and certainly not “where to buy a camera?” Meanwhile on Google those are common queries from budding photographers looking to purchase new equipment. That means ads that could persuade them to choose a certain camera brand can command a high price for Google and sweet, sweet ROI for businesses. Google also sees over 100 billion search queries a month. While these will “help” people discover new apps and content, I don’t see Sponsored Results as a big improvement to the user experience. Then again, they’re confined to search typeahead, so I see them as much more benign and in-line with Facebook’s business philosophy than the new non-social news feed ads for app developers and Page owners. Those could dilute the feed’s quality, which is core to Facebook’s value to users. The world has become quite accustomed to search ads, and people don’t spend all that much time in the search typeahead on Facebook. So if Sponsored Results can shut up some myopic critics who think Zuck isn’t maximizing shareholder value because he’s building for the long-term, I’ll support the ad unit. 1. Expanded distribution of your message, with placement in one of the most used features on Facebook. 2. The ability to target what people are looking for, by appearing alongside related Apps, Pages, and Places. 3. Flexibility to customize your landing destination, such as a specific tab on your Page. Brands are not able to drive offsite using this product, but you will have the ability to drive to specific Pages, Tabs, and Canvas Applications.